Half-pint glass milk bottles were found while preparing Stratton House for renovation. 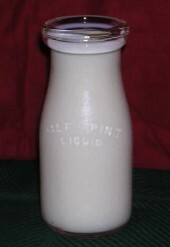 The glass milk bottles were in the original box of the manufacturer. These glass milk bottles are approximately 70 years old. They are in "as new" condition, despite their age. A number of the glass milk bottles are used in Stratton House Inn, to serve milk for breakfast, and for other purposes. Several of the glass milk bottles are for sale. The half-pint glass milk bottles are available for purchase -- in limited quantities -- as long as supplies last. A very small number of original bottle caps also have survived -- and are on display at Stratton House Inn -- but are not for sale. These glass milk bottles are about 5-inches high.